Xaverian H.S., Bay Ridge, is proud to have seven Eagle Scouts, from left are: Theodore Veroutis, senior; Vincent Mangano, junior; Nicholas Gangemi, senior; Peter DiSalvo, senior; Dimitri Leonardos, senior; amd John Hendricks, faculty member. 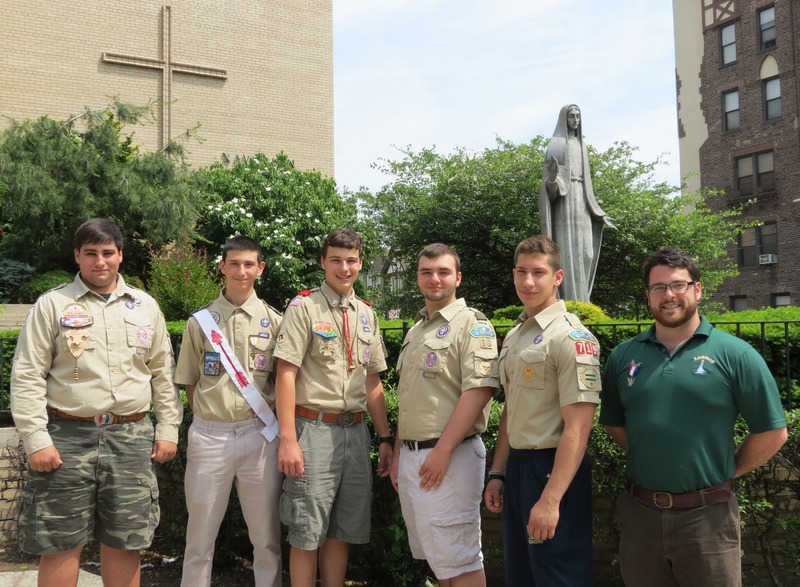 A total of six students and one faculty member are Eagle Scouts at Xaverian H.S., Bay Ridge. Eagle Scout is the highest rank attainable in the Boy Scouting Program of the Boys Scouts of America. Requirements include earning at least 21 merit badges and demonstrating Scout Spirit through the Boy Scout Oath and Law, service and leadership. This requires scouts to plan, organize, lead and manages an extensive service project. Senior Theodore Veroutis of Boy Scout Troop No. 531 in Brooklyn organized a canned food drive to benefit Catholic Charities’ food pantry at St. Mark parish, Sheepshead Bay. Junior Vincent Mangano of Boy Scout Troop No. 4 in Staten Island made a new trail in Clay Pit Ponds State Park Preserve for horse and pedestrian use. Senior Nicholas Gangemi of Boy Scout Troop No. 77 in Staten Island organized a cleanup of Blazing Star Cemetery. He managed the removal of garbage, debris, old signposts and other litter and planted flowers at the abandoned cemetery. Senior Peter DiSalvo of Boy Scout Troop No. 13 in Brooklyn restored a Greenbelt Trail on Staten Island. He and a team of volunteers remarked the trail and constructed three twenty foot bridges over creeks. Senior Dimitri Leonardos of Boy Scout Troop No. 715 in Brooklyn updated the Ceramics Center at the Guild of Exceptional Children. Senior George Raiola of Boy Scout Troop No. 99 in Brooklyn worked with a local police precinct to organize an “Operation Safe Child” program at St. Athanasius School. Police took photos, fingerprints, and other basic personal information from students to create ID cards to make the process of finding a lost child more streamlined and effective. Faculty member John Hendricks of Troop No. 332 in East Rockaway achieved the rank of Eagle Scout in Spring 2001. He worked with the Volunteer Fire Department/Medical Company in Lynbrook and created a “Use, Don’t Abuse” video that showed all the hard work volunteers in the Fire Department put into a medical call. It was broadcast on the Lynbrook Public Access Channel. He also made pamphlets, which he handed out door-to-door and at Lynbrook functions.